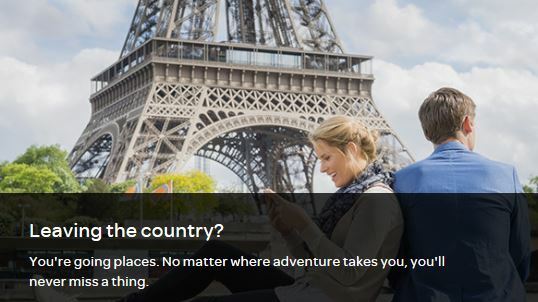 Since 2013, T-Mobile users can travel in over 100 countries for free. But AT&T users are not as lucky. I have had AT&T cell phone service for many years. I hate their international data plan known as AT&T Passport. It costs $40 a month and comes with only 200MB data, It is a complete ripoff, but since I don’t travel overseas that often, I do not bother to change service. I was thrilled last month when I heard about the new AT&T International Data Pass, and it only cost $10 a day! The new AT&T International Day Pass will let you use your data plan in over 100 countries. For $10 per day per device, customers will get 24-hour access to AT&T’s affiliate networks around the world. Data service will be available whenever they travel to countries such as U.K., France, Italy, China, India, Jamaica, the Bahamas, Central, and South America. The Day Pass also offers unlimited voice calls and text messages. To get started you will need a Mobile Share plan or an AT&T Unlimited Plan. The pass cannot be purchased separately. It is a feature you can enable on your existing AT&T devices. Once added, the feature will stay on your device unless you decide to remove it. One warning though, if you have apps running in the background that use data, you’ll be charged the daily fee. What? No International Data Pass in Japan? I am getting ready for my first trip to Kyoto. Among the many tasks that I have to do prior to the trip is getting my phone ready for Japan, which means finding the cheapest data plan available with AT&T. I was so excited about the new International Data Pass, and shocked when I found out Japan was not among the 100 countries! What?!! Looks like I am stuck again with the terrible AT&T Passport. Are you an AT&T customer and traveling soon overseas? If so, I hope you are heading to a country that is covered by the new International Data Pass. Sorry and I don’t mean to be a smartass but $10 a day! That’s like $300 a month. You’d be better off just getting a burner phone or a new sim card. I have Verizon and it’s just as bad. Even if you just traveled for a week you’re talking $70 for At&t service. I think I’ll just keep my “plan” = download Googlemaps area for offline use, use Googlevoice and wifi calling with Verizon and rely on Wifi for everything else. Yeah I don’t think the plan is meant for someone who travel overseas for an extended period. I personally wouldn’t use it for more than a week. I hope I am wrong but Japan is clearly NOT on the list of counties being included in this International Day Pass. When I add Japan online, it didn’t give me Day Pass choice; but when I add other counties such as China or HK that are in the list of counties, I was given the choice of Day Pass and not Passport. So it might be worthwhile to call AT&T and double check. Last time we were in Japan, we just stopped at one of the phone kiosks either in the airport or closeby…. bought a simcard and package. IIRC it was about US$18, and worked well for the week we were there. Unless it changed in the last 2 years, your American phone will not work in Japan. We spend two or three months a year in Thailand . Bought an AIS 3g pocket WiFi for about $47 . About $27 buys enough internet for near constant use with tablets for a month . Since I’ve had the pocket WiFi 3 years already I figure this years cost as ~$90 compared to the $900 it would be with AT&T’s plan . BTW all phones in Asia are GSM . I have heard of a similar WiFi device being available in Japan . I also read about a Tokyo hotel that furnished same for their guests . Correct but I use 50 gb a month. My monthly base would rise from 117 a month to 285 a month. I appreciate the help. It seems it’s an effort to eliminate the grandfathered, more generous plans. I am unlocking it and purchasing a SIM card instead. The 25 dollars and is cheaper, but not more convenient, than the $10 a day. If you have an unlimited plan that is grandfathered, it will not work. They require an upsell to the direct tv unlimited to qualify. So for a monthly satellite tv bill and term commitment, you qualify for the 10 dollars a day. Obviously, not a good deal. It works on my Mobil sharing plan (I think 30GB a month) and I don’t have Direct TV nor internet service with AT&T. And that’s why I’m switching to T-Mobile after 13 years with at&t. Enough is enough. For international travel, the free T-Mobile roaming can’t be beat. Free calls to the US via WiFi, otherwise calls are billed per minute. Sprint also has free international roaming unlimited (2G speeds, can pay for higher speed). Works great for most travels. $10 per day sounds awful.